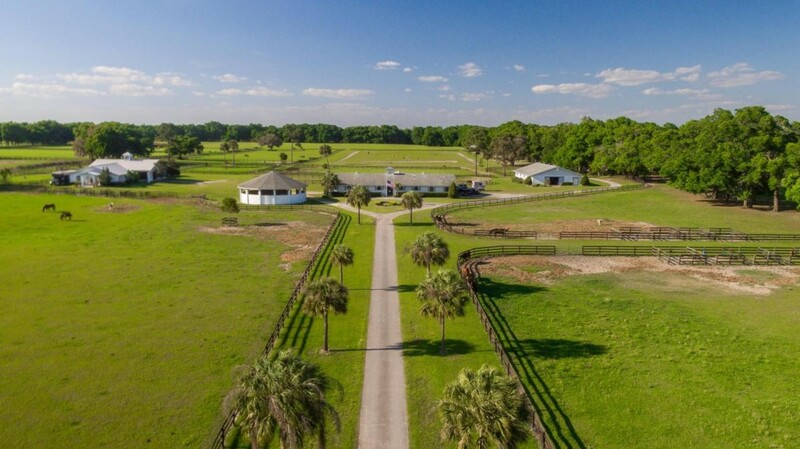 This 65-acre farm located in scenic Citra, Floria is represented by Valerie Dailey of Showcase Properties of Central Florida. Star Runner Farm is perfect for the serious animal breeder, trainer or show horse professional. Located at 1441 East Highway 316, Citra, Florida, this home is near historic Cross Creek and attractions in Gainesville. The property includes three barns totaling 22 stalls, a complete show ring, and many shaded paddocks. The main barn is equipped with a large grooming area and spacious office. A stallion barn offers extra-large stalls, a breeding shed and lab, and an apartment. In the main home has three-bedroom and 3.5-bathrooms, an open floor plan, large fire place, and screen-enclosed pool. The garage is very spacious, with a game or workout room and guest room with full bath and sauna. A separate guest house with attached manager’s apartment completes this amenity-loaded property.